I got home from work last night and took my knee out for a two mile test run along the river path. The first time I’d had my running shoes on since the Great North Run. It was a gorgeous evening for it and I arrived back at my front door without having crippled myself, which I think is always a good place to start. I am quite quite mad. Of my madness I have no doubt, but then I never have had any about that. I registered for the 2015 Brighton Marathon about five months ago and told three people, and decided that I could bottle out of it if the Great North Run did not go according to plan. It was never about getting a specific time or running a perfect race. It was about the fact that if I got to autumn and hadn’t found the time or the motivation to train properly for a half-marathon, it was unrealistic to think that I’d have either of those things for a full marathon. As the start line of that race drew nearer and my miles started to add up, I started to tell a few more people of what I was planning for the spring. And the position I find myself in now is that while the Great North Run did not go according to plan, most of the training for it did and so there will be no bottling out. It is four years since I ran my first half marathon (when I was a medical student with lies-in and free time and all that jazz). I’m excited to find out what my legs will do when they go beyond thirteen miles. I have chosen not to run this time for charity. (This is both why I registered so stupidly early and why I wasn’t tempted to try for London.) I’ve been trying to find a less pretentious thing to call this than self-actualisation, but that’s what Maslow would call it. It’s always that, on some level, and that won’t stop me fundraising for the Great North Run next year. But this one is very much for me and for the achievement of a fairly long held was-really-meant-to-be-a-pipe-dream type of dream. It would feel a little weird to try to fundraise for that. I feel that it also gives me a little extra allowance to bore social media with my training woes without feeling so terribly mercenary. I am also doing it as a bit of a birthday present to myself. I have been told at this point by many people that this is really very mad, more than is normal, but the week between Easter Sunday and Marathon Day will be the occasion of my becoming A Little Bit Old. I am really looking forward to marking my thirtieth birthday with a really long run along Brighton seafront. 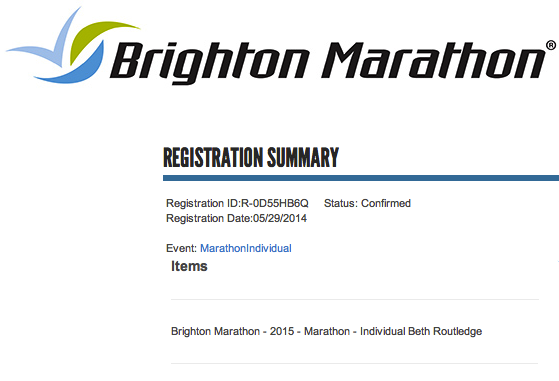 This entry was posted in Blog and tagged brighton 2015, marathon, running. Bookmark the permalink. Excited for your run & coming of age! Woop, good luck! And well done with the Great North Run. I did the Birmingham one yesterday and had the BEST time, I want to do another one already. A marathon might be a stretch too far though (on my knees and my sanity! ).